RNA world preceded time prebiotic synthesis when born anyway necessary for replication of the molecule – nucleotides, proteins, lipids. First we consider the process of chemical synthesis alone. Now in the laboratory John Sutherland found path that leads to the synthesis of a considerable range of biological molecules. No need to guess what it was before, RNA or proteins – they probably were synthesized simultaneously in a single cascade of chemical reactions; it appears at the beginning of hydrogen cyanide and hydrogen sulfide with metal catalysts. This network of reactions authors called tsianosulfidnym protometabolizmom. With the release of new research we can talk about a turning point in the science of the origin of life. John Sutherland (John Sutherland) with the team from the Laboratory of Molecular Biology Research Council for Medicine at the University of Cambridge (UK) continued their fascinating study of the first stages of the origin of life – the appearance on the planet of biological molecules. About five years ago, they described a simple way of synthesis of pyrimidine nucleotides, most of those who could not manage to get out of simple substances (see . 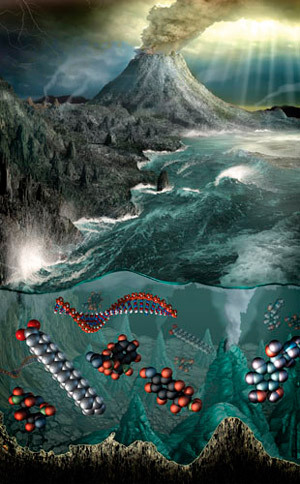 : chemists have overcome a major obstacle on the way to the abiotic synthesis of RNA, “Elements”, 18.05.2009). This required a heated nitrogen bases (Cyanamid) along with sugar (glycolaldehyde) tsianoatsetilenom and in the presence of phosphoric acid under ultraviolet irradiation. As a result, the wonderful, albeit understandable way for chemists obtained pyrimidine ribonucleotide – cytidine and uridine. And while a high final yield of the product, in substantially purified form of impurities, since other reaction by-products are unstable to UV radiation (Fig. 2a, this shows part of prebiotic chemistry blue arrows). All those involved and interested in the early evolution of life, were delighted. Among emotional endorsements sounded quite sensible questions: where to take the early Earth glycolaldehyde in large quantities? – Yet it is not quite a simple matter. For three years the team Sutherland managed to solve this problem (D. Ritson & JD Sutherland, 2012. Prebiotic synthesis of simple sugars by photoredox systems chemistry) – and again, elegant and affordable. Chemists synthesized glycolaldehyde and glyceraldehyde of hydrogen cyanide; the reaction proceeds in the light and in the presence of cupric sulfide. But what was the joy of scientists when they found as side (!) 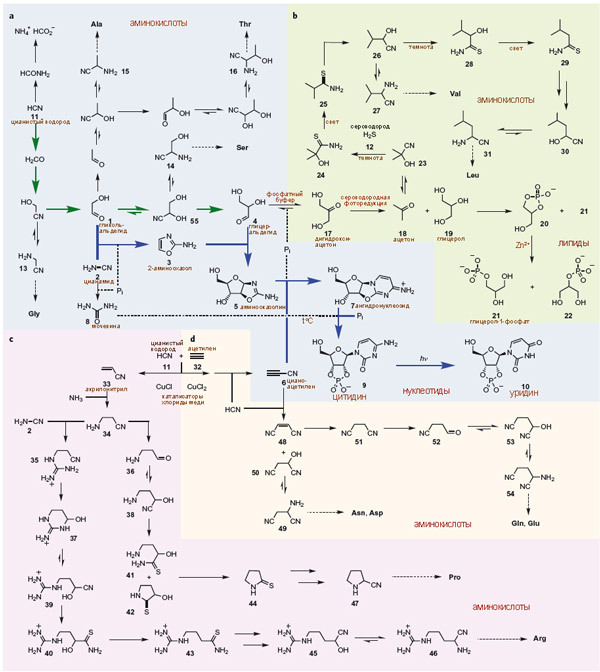 Reaction products of α-aminonitrile synthesis – the precursor amino acids glycine, serine, alanine and threonine (D. Ritson & JD Sutherland, 2013. Synthesis of Aldehydic Ribonucleotide and Amino Acid Precursors by Photoredox Chemistry). Fig. 2a shows the path of the green arrows. Of course, it was impossible to stop: it is clear that detected a network of reactions – is a gold mine prebiotic synthesis. And the same winged team became more study of the reaction product mixture of hydrogen cyanide, hydrogen sulfide, phosphates and various divalent metals. First and foremost, it was decided to consider further the transformation of glyceraldehyde phosphate buffer – was theoretically a more stable three-carbon isomer. Indeed, he was found: glyceraldehyde gradually but in good yield (59%) was converted into dihydroxyacetone. And that, in turn, in the presence of hydrogen sulfide in the light is split into acetone and glycerol. Having these substances, chemists scented victory – to lipid synthesis remains quite a bit. And if the resulting mixture to heat up (and we remember that the process is in phosphate buffer) with the catalyst (zinc), the flask would be glycerol-1-phosphate and glycerol-2-phosphate – precursor lipids. The yield of these products was impressive: an amount of 71%. And if alternate light and darkness, that occur one after the other (as a nice supplement) conversion reaction of acetone in the amino acids – valine and leucine. Then, it turned out that of acetylene and hydrogen cyanide in the presence of various copper compounds and hydrogen sulfide may also be synthesized amino acids arginine, proline, asparagine, aspartate, glutamine and glutamate. And by the way, a necessary product in the conversion of hydrogen cyanide in the presence of an amino acid is cupric cyanoacetylene, the same one that was in demand for the synthesis of pyrimidine. That’s a real primordial soup, or, if you prefer, a hypothetical warm pool! John Sutherland and his colleagues are now imagine this ancient pond zhiznerodny much clearer than anyone else. This warm pool became overgrown chemical realistic detail. Chemists have put it during Katarchean when our planet has experienced the hard way all the hardships of late meteorite bombardment. Here’s how it could happen. In collisions carbonaceous substance meteorites coalesced with atmospheric nitrogen, as a result of the high temperature reaction, hydrogen cyanide is synthesized. From meteorite schreibersite – iron-nickel phosphide – with high energy of impact of events results in phosphates. In the presence of water (here it is – the warm pool! ), Hydrogen cyanide dissolved and combined with iron to form ferrocyanide. There also were washed chlorides, soluble compounds of sodium, potassium and calcium – all that in abundance was the young Earth. When the puddle evaporates, and she had to evaporate due to the high surface temperature of the planet and meteorite bombardment, heated ferrocyanide and interacting with the potassium, sodium, calcium form the corresponding cyanide, carbon and carbides. This layer of solid salts only promising, since their dissolution and heating is a set of necessary for “life” of ingredients: hydrogen cyanide, cyanamide, acetylene. The latter is formed by dissolving in water the calcium carbide. Phosphates and hydrogen sulfide are included. To broth was prepared, our pool was dry and again periodically filled with water periodically illuminating and sometimes dive into the darkness. And then it itself could go once all the necessary synthesis of biomolecules: nucleotides, amino acids, lipids. Scientists have proposed a network of interconnected reactions, and even if the start is given, the output will turn the whole set. There is no need to guess what it was before – amino acids and proteins or sugar ribonucleotides. Everything was right. The warm pool – it is hot and becoming dry pond filled with cyanide and hydrogen sulfide, hard UV lit: welcome to life! Chemists still have serious work to unleash all the nodes of the network of chemical, but the main thing – that the gap between simple organic molecules and the molecules of life is no more. Now there is a bridge that chemists call tsianosulfidnym protometabolizmom. Probably, this term will very soon become fashionable, popular and very meaningful.